Apostolic Constitutions: . . . Wherefore care must be had to avoid destructive shepherds. Hear, O you bishops; and hear, O you of the laity, how God speaks: I will judge between ram and ram, and between sheep and sheep. And He says to the shepherds: You shall be judged for your unskilfulness, and for destroying the sheep. 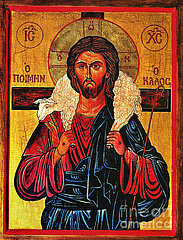 That is, I will judge between one bishop and another, and between one lay person and another, and between one ruler and another (for these sheep and these rams are not irrational, but rational creatures): lest at any time a lay person should say, I am a sheep and not a shepherd, and I am not concerned for myself; let the shepherd look to that, for he alone will be required to give an account for me. For as that sheep that will not follow its good shepherd is exposed to the wolves, to its destruction; so that which follows a bad shepherd is also exposed to unavoidable death, since his shepherd will devour him. Wherefore care must be had to avoid destructive shepherds. This entry was posted in Apostolic Constitutions and tagged Bishop, Clergy, False Ecumenism, Heresy, Heretic, Layman, Questioning Bishops/Priests/Clergy, Shepherd, Spiritual Death on May 17, 2014 by .